After murder, 'Jerusalem Belt Forum' warns terrorists liable to emerge from illegal EU buildings just a walk away from Mishor Adumim store. Hours after the lethal stabbing attack at a Rami Levy supermarket branch in Sha'ar Binyamin, in which a 21-year-old shopper was murdered and another 36-year-old was moderately wounded, the "Jerusalem Belt Forum" issued a warning. In the attack two 14-year-old Arab terrorists from nearby Bitunia got past security with knives brought from home before going on a rampage, until they were shot by two armed civilians in the store and arrested. The 21-year-old victim was later identified as IDF Sergeant Tuvia Yanai Weissman. According to the "Jerusalem Belt Forum," the next attack in a shopping center is just a matter of time. "The dozens of structures that were established against the law by the European Union for the Bedouins in the Adumim district are a ticking time bomb," said Yaniv Aharoni of the forum. "Throughout the length of Highway 1 there are collections of illegal Bedouin settlements whose demolition is not enforced by the Civil Administration." Aharoni warned that "the next murderer is liable to emerge from these structures any moment, and at a distance of a short walk he will reach the shopping center at Mishur Adumim for a bloody attack." 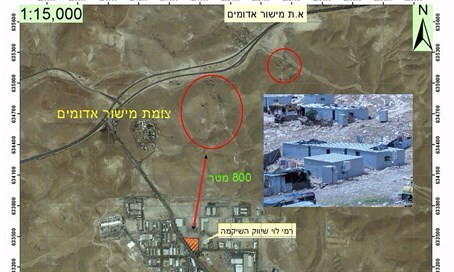 The distance from the nearest illegal structures to the Rami Levy in Mishor Adumim shopping center is only 800 meters, just under half-a-mile, according to the forum. The "Jerusalem Belt Forum" noted that just this Wednesday, a day before Thursday's attack, the High Court rejected the petition by Regavim to demolish the EU-funded illegal Arab buildings, after the state said the demolition is not a "priority." "Apparently there is one law for Jews at a synagogue in Givat Ze'ev and another law for the European Union that acts in Israel as if it was at home. The humiliation in the lack of enforcement of the law against them is liable to cost in lives," said Aharoni. The warning about the Rami Levy store in Mishor Adumim comes as police continue to investigate the event. Rami Levy on Thursday night was summoned by police to come in for questioning on Sunday regarding the incident. Rami Levy has in the past been criticized for employing Arabs, particularly after an Arab terrorist stabbed two Jewish shoppers at a branch in Mishor Adumim to the east of Jerusalem in December 2014. The terrorist apparently was aided by an Arab employee who gave him the knife he used to moderately wound the two. Last October a woman was stabbed in the spinal column by an Arab terrorist at a Rami Levy parking lot in Gush Etzion. Miraculously she made a quick recovery from the attack, after having been moderately wounded.